If you give the government an extra dollar, they will spend it, and they will spend it in such a way that it will need to be replaced every year forever and with yearly increases. In fact, there seems to be a direct correlation between how much the government gains in taxes and how fast the national debt increases. If you don’t understand what causes this relationship then you are a very logical person, but unfortunately, a remarkably naïve one. Everything is taxed, and the same people pay all of it. Decades of pro-government propaganda and the constant drone of politicians buying votes has led many to error on this. Consider buying a loaf of bread. To produce that loaf and make it available for purchase, there were numerous taxes paid: property taxes, fuel taxes, storage, communications and employment taxes, utility taxes, sales taxes and many, many more. Who pays these? The people who buy the bread. Somewhere down the line, every tax is paid by the same people. Everything else is smoke and mirrors and the manure produced by male bovines. Businesses and corporations do not pay taxes, they simply collect a type of sales tax for the government. A tariff on steel makes steel more expensive, so it costs more to build an office building, so the company in the building charges more for its products. No, the magical nonsense is the demagogues and politicians buying favors and votes by telling you what wonderful stuff they are going to buy you with another person’s money. For those of you who still buy into this nasty nonsense and think it is a privilege to give to modern governments, and especially you who demand that other people pay more, I offer my yearly advice. You can give more of your money to government. It is legal. You don’t have to give 18%. You can give 50% or even more. Go on, cough it up. It will make you feel better. And when you are older, don’t give any of your wealth to your children, make sure the government gets it all when you die. Why shouldn’t everything belong to the government? There is no need to smile just on April 15. You can smile every time you buy a gallon of gas, or pay your utility or cable bill. In fact, you can smile when you buy anything, knowing you are paying an extra 30% to 60% more for taxes. 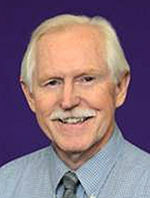 Dennis Clayson is a marketing professor at the University of Northern Iowa. The opinions expressed in this article are those of the author, and do not reflect those of the University of Northern Iowa. FY 2016 - $3.27 trillion. FY 2015 - $3.25 trillion. FY 2014 - $3.02 trillion. FY 2013 - $2.77 trillion. FY 2012 - $2.45 trillion. FY 2011 - $2.30 trillion. What you're seeing there is the deficit drastically falling yearly (which means less added to the national debt yearly) as tax revenue went up, largely due to the Obama administration raising the top tax bracket on the wealthiest Americans. The administration also reigned in spending, despite what you may have heard on FOX News. Since Trump and the Republicans took over, they cut taxes on the wealthy and have drastically reduced the amount of revenue brought in. Meanwhile, they have increased spending and blown-up the deficit, adding to the national debt at a much greater rate.